Here are some things worth considering before making a domain name choice. Whether for business or hobby, you will want a domain name that is unlikely to have future conflicts with the interests of a company that is proactive about protecting their marketing strategies. If you are the owner of a Federally Registered Trademark or Service Mark, you should definitely consider registering a domain name that is the same as the words in your "mark". If you have your own Trade Name that is not registered, a domain name with the same phrase should be considered, but weighed against the ideas and suggestions below. But you can consider it common sense advice. If you have any doubt about a domain name choice consider consulting with your attorney. Registration of a business name with a State's business licensing agency can provide the legal right to use that registered business name as a "trade name" for the business within that State. However, use of that trade name might not be unique to that State, as there could easily be another business registered as "Joe's Trucking" in another State. Also, a State registration of a trade name does not grant any right to the use of that trade name in another State, nor does it grant rights to an Internet domain name. Note also that a business registration of a trade name within a State is not the same as a Federally Registered Trademark. A Federally Registered Trademark can provide the right to use the Federal Registration Symbol (®) on goods, packaging, printed matter and in media. In the USA this type of registration must be done through the US Patent and Trademark Office. While a Federally Registered Trademark does not assign the right to a domain name, having a Federally Registered Trademark with the same text as a desired domain name could certainly strengthen your argument that you are entitled to have the domain name registered to you. A domain name is part of a web address that links to the internet protocol address (IP address) of a particular website. For example, in the web address “www.uspto.gov,” the domain name is “uspto.gov.” You register your domain name with an accredited domain name registrar, not through the USPTO. A domain name and a trademark differ. A trademark identifies goods or services as being from a particular source. Use of a domain name only as part of a web address does not qualify as source-indicating trademark use, though other prominent use apart from the web address may qualify as trademark use. Registration of a domain name with a domain name registrar does not give you any trademark rights. For example, even if you register a certain domain name with a domain name registrar, you could later be required to surrender it if it infringes someone else’s trademark rights. 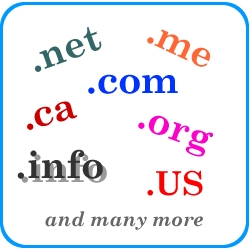 Once you are familiar with the structure of an Internet domain name you are ready to start considering available choices. Although the structure of a domain name does have some requirements and limitations, the possibilities can seem endless. From reading Structure of an Internet domain name you also know that you have the option to use one or more hyphen characters (-) between letters and numbers in a domain name. You can't use a hyphen at the beginning or the end of a domain name. Now you know, so you can also check for available variations of a domain name that include one or more hyphen characters. For purposes of selecting a domain name for a public web site, perhaps your ideal choice would contain the most descriptive or most memorable term(s) or phrase about the topic of your web site's content focus, business name, product or service. If you haven't already done so, stop and give it some thought. Make a wish list with your first choice, second choice, and so on so that you have considered more than just one possibility for your domain name. To start, just write down the first few names that seem to make sense for your web site. This list should come in handy very soon. A reasonable, contemporary thinker would also be aware that they are by now likely to NOT be the first to try to market online pet supplies, automobiles, diet supplements, etc. The same is likely to be true for just about every product and service category that exists. So don't be heartbroken if your first choices for a domain name are already used by someone else. That's why you made a list. For years companies have been creating new "words" in the form of unique spellings, and while those spellings may not be correct in English (or any other language), sometimes they can reflect the phonetic pronunciation of their business name, product or service. Often, these can be a mnemonic, or are shortened to an acronym for use as an Internet domain name. If your need for a domain name is of a hobby nature rather than a business nature, such as the simple implication of the hypothetical domain name FREDS-FRIED-FRITTERS-TECHNIQUES-BLOG, and whatever name you choose filters through the narrative above, likely you will have no need for attorneys, trade names or registered trademarks. Depending on your desired domain name, it may, or may not be available. Remember that by the time you read this millions of people have already purchased domain names for their purposes, and your first choice of a domain name may not be available. There is something available that can be made to work. You can use these techniques for selecting a name for your web site, although you should also do some checking around the Internet before you make a domain name purchase to get an idea of whether your domain name choice might be stepping on someone else's legal right to a trade name or trademark. It wouldn't hurt to contact an attorney who specializes in Trademarks about your name choice, especially if you think there is any "gray area". One word of caution before you finalize your domain name purchase: BE CERTAIN THAT YOU HAVE TYPED AND SPELLED THE DOMAIN NAME THE WAY YOU WANT IT SPELLED. Registration services make the assumption that you have correctly typed the desired spelling of your domain name purchase. Now, armed with the knowledge you have acquired from reading here - and your list - you are ready to do a "live search" for an available domain name for your web site project. You can get an instant response from Interclix Hosting to let you know if a domain name is available, and register it immediately to secure it BEFORE it's gone. Secure your domain name NOW! Domain name seekers should avoid choosing a domain name that includes another company's trade name or trademark. Expect legal action sooner or later from the trade name or trademark owner if you choose to mess with someone else's livelihood.